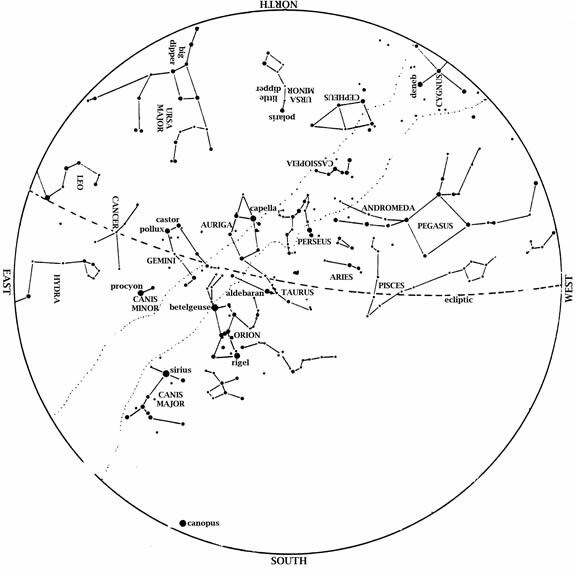 This star map shows the Houston sky at 90 pm CST on January 1, 8 pm CST on January 15, and 7 pm on January 31. To use the map, put the direction you are facing at the bottom. The Great Square of Pegasus sets in the western sky. Taurus, the Bull, is almost overhead. Dazzling Orion, the Hunter is high in the southeast, with his two dogs behind him. Sirius, the Big Dog Star, is the brightest star we ever see at night. Jupiter, in Gemini, is up all night long in early January. In the north, the Big Dipper gradually re-enters the evening sky. This month, Venus shifts from the evening to the morning sky. For the next few days, look for it low in the southwest at dusk. If no buildings or trees block the view, you can still make out Venus in the twilight; it outshines everything in the sky but the Sun and the Moon. Notice how it appears lower on the horizon each night and is soon completely gone. On Jan. 10, Venus passes between Earth and Sun (“inferior conjunction“), which would normally make it invisible to us. This time, however, Venus passes above the Sun from our perspective, which means the sharp-eyed observers with clear horizons can observe Venus both at dawn and at twilight for a few days around Jan. 10. After this, you can watch Venus emerge in the morning sky, visible in the southeast at dawn. Venus remains a morning star for almost all of 2014. Mercury briefly enters the evening sky this month, right as Venus leaves. Look for it low on the horizon during the last half of January. Although not nearly as bright as Venus, it easily outshines the dim stars near it. Thus, any “star” you see in twilight over the point of sunset late this month is probably Mercury. Jupiter will remain well placed for evening observing all winter and into the spring (as the Earth passed between it and the Sun on Jan. 5). Look for it in the east at dusk and almost overhead later in the evening. Mars remains in the morning sky. It continues to brighten a bit in the southwest at dawn. Saturn has reappeared in the pre-dawn sky. Face south-southeast right before sunup to see it. In January, the Big Dipper is only partly risen at dusk. As the Big Dipper sets, though, Cassiopeia rises. This is a pattern of five stars in a distinct W (or M) shape which lies directly across the North Star from the Big Dipper. Look for Cassiopeia high in the north on fall and winter evenings. Watch for the Great Square of Pegasus in the west at dusk. Taurus the Bull is high in the south. Look for the Pleiades star cluster above reddish Aldebaran. Dazzling Orion the Hunter takes center stage on winter evenings. Surrounding Orion are the brilliant stars of winter. Orion’s belt points down to Sirius, the Dog Star, which outshines all other stars we ever see at night. The Little Dog Star, Procyon, rises with Sirius and is level with Orion’s shoulder as they swing towards the south. To the upper left of Orion’s shoulder is Gemini, the Twins, which contains Jupiter this winter. New: Jan. 1, 5:15 a.m.; Jan. 30, 3:40 p.m.
1st Quarter: Jan. 7, 9:40 p.m.
Full: Jan. 15, 10:53 p.m.
Last Quarter: Jan. 23, 11:21 p.m.
At 5:59 a.m. on Sat., Jan. 4, the Earth is as close to the Sun as it will get this year; this is called perihelion. Keep in mind that Earth’s orbit is so close to being a perfect circle that its perihelion distance is 0.98 AU, where 1 AU (astronomical unit) is defined as the average Earth-Sun distance. This 2% difference is too small to influence our seasons; the tilt of the Earth’s axis toward or away from the Sun dominates this small effect. That’s why it’s so cold right now (even here in Houston!) and so hot in July. Although the winter solstice is the shortest day, the earliest sunset occurred on about December 2, and the latest sunrise will occur January 10. That’s because the Earth speeds up on its orbit near perihelion. This acceleration shifts sunrise, local noon, and sunset slightly later each day at this time of year. The effect is smaller than that of the Sun taking a low path across the sky, which normally dominates in causing earlier sunsets and later sunrises. But the Sun’s apparent path varies very little near the solstice itself, allowing the secondary effect of the Earth being nearer to the Sun to predominate. For most people, then, (those who witness sunset but sleep through sunrise), days will seem to lengthen much more than they actually are. Early risers, on the other hand, will find sunrise occurs even later than last month, at least until late January. The New Moon of Jan. 30 is the second New Moon after the winter solstice. It therefore marks Chinese New Year. On this date, the Year of the Snake ends and the Year of the Horse begins. On most clear Saturday nights at the George Observatory, you can hear me do live star tours on the observation deck with a green laser pointer. If you’re there, listen for my announcement. We’re also hosting telescope classes on Jan. 11, so if you or someone you know received one over the holidays come by and let us help you set it up!